Our Oxygen cans contain 95% Oxygen, 5% Ambient Air. Oxygen as a supplement acts as a natural “BOOST” to your system when it is oxygen-deprived. It does not provide a superficial jolt to the central nervous system because it has no caffeine and no sugar like other unnatural stimulants and energy drinks. 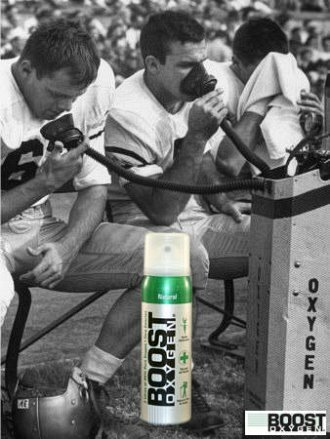 I have seen Football Players using Oxygen on the sidelines of games, why is this? Football is a game of quick, high intensity bursts of energy, coupled with violent contact. Athletes are under intense physical and mental stress combined with extreme aerobic and anaerobic activity. As a result, their bodies emit more carbon dioxide during the game than they admit in oxygen. Muscle and mental fatigue occur- especially in the later parts of the game. Even though they are some of the best conditioned athletes in the world, many elite football players choose to use supplemental oxygen to recover faster, avoid cramping, and stay fresh physically and mentally to the end of the game. The can is so light- is it empty? Of course not! – Oxygen gas is virtually WEIGHTLESS. Our sealed cans are very LIGHT, but they are full. The weight of a full can feels empty as the Oxygen inside has no discernible mass. The advantage is that they are very light and convenient to carry around. It all depends on how deeply you breathe in. Our 4 oz cans contain approximately 20-30 inhalations and our 18 oz cans with a connected mask contain approximately 35-50 inhalations. Some individuals take normal 1 second breaths, others take longer 3 or more second inhalations. It’s a matter of personal preference. Why do you use aromas? As pure Oxygen is also odorless and tasteless, aromas provide the user with a different perception of use. In addition, the Aromatherapy fragrances we use can give the user additional benefits beyond what traditional unflavored oxygen gives. However, the majority of the people who have purchased our Boost Oxygen have preferred the ‘Natural’ or unflavored. It is simply a matter of preference, the Oxygen is 95% pure regardless of the fragrance. All of our aromas are food grade, and are generally recognized as safe. Why are you donating a portion of your profits to the Wounded Warrior Project and/or other Disabled American Veterans charities? Many charities do good works and address very specific and real needs in today’s society. Members of our armed services that make the ultimate sacrifice so that our nation can live in historically unparalleled safety and stability are our country’s greatest heroes and deserve the most we can offer. Governmental bureaucracy can unfortunately reduce the quality of care afforded to our disabled vets, and the WWP and other charities do a terrific job of filling this void. This depends widely on your circumstances, body weight, type, etc. If you are working out in the gym and want to recover more quickly between sets, 2- 3 inhalations between sets when needed might do the trick. Same for the high altitude, stress and ‘second wind’ applications. If you are really hung over, jet lagged, you may need more than this. The attractive benefit to oxygen is that the effects are fairly immediate – oxygen is admitted into the blood stream directly, so you should be able to gauge after the 3-5 inhalations if you need any more. BOOST Oxygen states that “NOT for Medical or Prescription Use”. What does this mean? Oxygen therapies that are prescribed by a medical doctor to treat medical conditions is something completely different than BOOST Oxygen. BOOST Oxygen is Recreational Oxygen (95%), not USP Medical Oxygen (defined as 99.2% or above). Although both are produced in the same manner, Recreational Oxygen is designed for healthy people looking to supplement and improve different facets of their life, and is not intended for use by anyone who has asthma, lung ailments or heart problems or as a substitute for physician-prescribed or life-saving oxygen. No. Oxygen gas alone is not flammable, contrary to popular belief – (otherwise our 20.9% oxygenated atmosphere would have burned up a long time ago!) Oxygen is not a fuel itself, but when combined with a fuel and ignition, it can serve to accelerate the chemical reaction. Can I Take BOOST Oxygen through TSA Security at a U.S. Airport? NO! NO! NO! All caned oxygen products are forbidden from taking them on an airplane. You can not put it in your carry on luggage, or your luggage that is checked in and loaded by the airlines. For more information, please read the attached letter from the FAA. If any product is damaged in shipping or is received in a defective state, please send the product back to the company at the address below with a copy of the receipt and an explanation for its return. Upon satisfactory conclusion by Boost Oxygen LLC that there was a manufacturers defect or damage in shipping, a full refund will be issued within 2 weeks of receipt.